Are you interested in sports, exercise science or wellness? 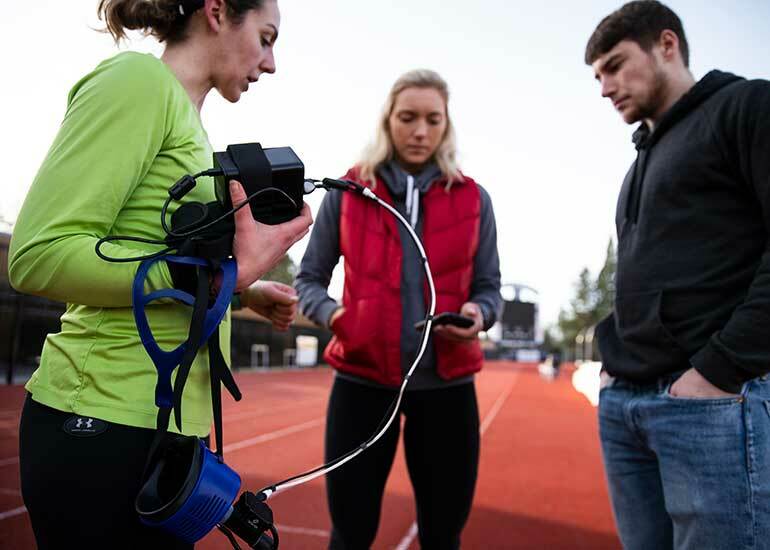 George Fox University’s health and human performance major – with one of its three concentrations – gives you a comprehensive science-based education and clinical foundation in a Christian college setting. Study health and nutrition, the biomechanical principles of human motion and motor learning, and gain techniques for teaching skills, stunts, games and sports. In addition to the health-related courses, you’ll take general education classes ranging from Bible and humanities to communication and mathematics. Those interested in all aspects of fitness would benefit from a fitness management concentration within the health and human performance major. More than 40 credit hours are offered in the field, including aquatics, tumbling/gymnastics, principles of conditioning, first aid and safety, exercise prescription, exercise physiology, and motor development and motor-skill learning. This is an ideal concentration for those who wish to work in the fitness industry and help clients with their fitness goals. The concentration incorporates 42 to 43 course hours of study. Take the first step toward becoming a teacher. The 37-hour course of study emphasizes a wellness theme that incorporates individual responsibility and promotes a healthy lifestyle. The curriculum covers the sciences, including kiinesiology, exercise physiology and nutrition, as well as classes that address societal topics, including drug education, contemporary health issues, the sociology of families, and stress management. Students who wish to become health teachers are essentially entering a five-year program. They take the health preteaching concentration, and upon successful completion, are directed to enter a one-year Master of Arts in Teaching program. Upon completion of the MAT, students will be certified to teach K-12 health or obtain positions in community, public health, and health promotion settings. This concentration focuses on skills acquisition and teaching methodology pertaining to team and individual sports and lifetime recreation. The curriculum includes courses that cover teaching as a profession, aquatics, field sports, sports psychology, kinesiology, exercise prescription, and motor development and motor-skill learning, as well as instruction in specific sports, including tennis, volleyball, basketball, golf and tumbling/gymnastics. Students customize the concentration by choosing a coaching class that covers a specific sport (basketball, baseball/softball, soccer, track or volleyball), or opting for either a course in care and prevention of athletic injuries or nutrition. All told, the concentration incorporates 44 or 45 hours of study. Students who wish to become physical education teachers are essentially entering a five-year program. They take the physical education preteaching concentration, and upon successful completion, are directed to enter a one-year Master of Arts in Teaching program. Upon completion of the MAT, students will be certified to teach physical education. Request more information about the health & human performance major at George Fox University or schedule a visit to begin your education at Oregon's Christian university, ranked as one of the top Christian colleges in the nation by Forbes. According to the Bureau of Labor Statistics, overall employment of health educators and community health workers is projected to grow 16 percent from 2016 to 2026, faster than the average for all occupations. This will be due in part to national efforts to improve health outcomes and reduce healthcare costs. Employment of coaches and scouts is expected to rise 13 percent during the same time period, due in part to increasing participation in high school and college sports. Fitness trainers and instructors should see a growth rate in their field of 10 percent through 2026. Fitness management majors are required to procure an internship at a fitness facility for a total of at least 240 hours and to keep a journal of their work-related activities. Students who choose the physical education pre-teaching concentration are often asked to help in both public and private school classes. Students concentrating in both health pre-teaching and physical education pre-teaching who aspire to a career in coaching are often sought out to fill openings in youth and junior high teams as well as local youth leagues. "Studying HHP has been so rewarding. I feel that my personal curiosity about how the body works and why we function the way we do during exercise or when there is stress on the body has been thoroughly explained. Classes like Kinesiology and Exercise Physiology break down what is happening while classes like Contemporary Health Issues and Drug Education explain some of the social aspects of health. Professors and peers have greatly shaped my experience at Fox and I have grown academically, spiritually and personally in my time here." Students receive strong exercise science preparation. Activity specific peer teaching opportunities are available. Highly sought internships are available locally. Our 14-to-1 student-to-faculty ratio means you’ll get to know your professors on a personal level.